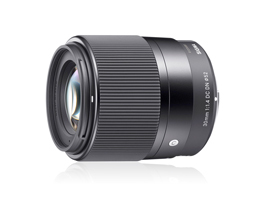 Part of the DN range of lenses for mirrorless cameras, the Sigma 30mm f/1.4 DC DN C (Sigma 30mm f/1.4 DN) is a fast-aperture, third-party standard prime for Sony E-mount cameras. Taking into account the 1.5x crop factor on Sony APS-C sensors, the Sigma 30mm f/1.4 lens offers an equivalent 45mm focal length, making it a good option for a variety of subjects, including portraits and general use. Featuring a bright f/1.4 maximum aperture, it’s a great option for low-light shooting environments, too, and the fast aperture, combined with its 9 circular aperture blades, can produce attractive background bokeh and shallow depth-of-field effects. For easier use with filters, the internal focus system keeps the front element static during focusing, and the 30cm minimum focus distance makes closeup photography a possibility, too. Costing just $339, the Sigma 30mm f/1.4 DN is an affordable lens that opens up some new shooting possibilities for Sony shooters. Let’s see how its DxOMark scores stack up. Achieving an excellent score of 29 points tested on the Sony A6000, the Sigma 30mm f/1.4 DN is the highest-ranked Sony E-mount lens we’ve tested. It’s also the brightest, boasting great light transmission of 1.8 TStop thanks to its wide maximum aperture setting. The Sony version doesn’t fare quite as well as the MTF version previously tested for other lens metrics, such as distortion, vignetting, and chromatic aberration, due to the larger APS-C sensor that the Sony version covers. At the maximum f/1.4 aperture setting, noticeable corner shading of –1.7EV occurs, although it significantly improves to –1EV at f/1.8 and is completely eliminated by f/2.8. Chromatic aberrations are well-controlled across large parts of the frame, and although some fringing in the very far corners affected the overall score, it shouldn’t have a big impact on your pictures. Barrel distortion of 1.5% will benefit from some post-production correction to achieve straight lines. Sharpness is a significant improvement over the Micro-Four-Thirds format version, however, and its score of 16 P-Mpix is the joint highest sharpness score achieved on a Sony E-mount lens alongside another Sigma prime (the 60mm f/2.8 DN A). 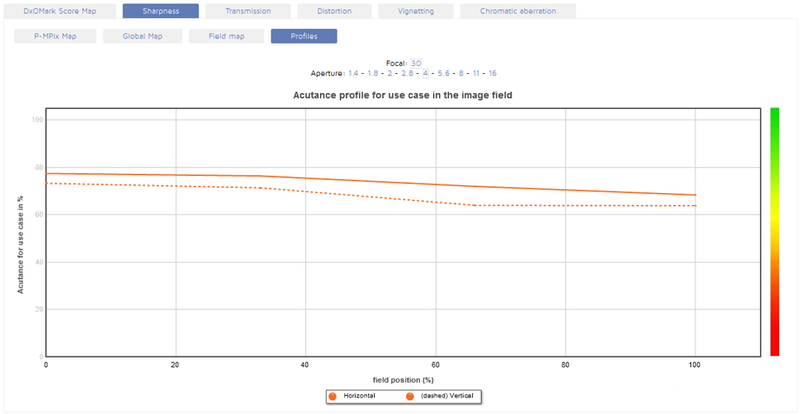 Resolution is strongest between f/2.8 and f/5.6, with acutance approaching 80% across large parts of the frame and only minor drop-off in the corners. Wide open at f/1.4, the Sigma 30mm f/1.4 DN is not completely uniform, but it’s not far off, with acutance around 65% in the center, dropping to 60% at the edges. Diffraction at narrower f/11 and f/16 apertures reduces sharpness, which drops just below 60%, but resolution is reasonably uniform at these settings, too. 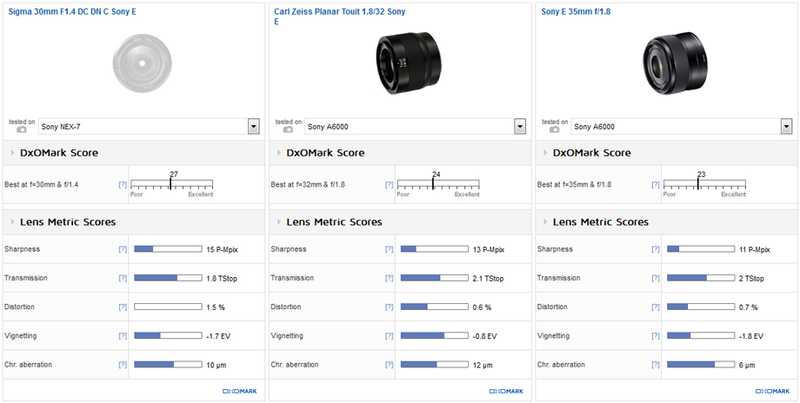 Comparing the Sigma 30mm f/1.4 DN with the $720 Carl Zeiss Planar Touit 1.8/32 (Zeiss 32mm f/1.8) and own-brand $398 Sony E 35mm f/1.8, the Sigma lens is better in a number of respects. Not only is it the cheapest, despite boasting a larger maximum f/1.4 aperture, it also offers the best light transmission and significantly improved sharpness. The Sigma 30mm f/1.4 DN is actually sharper and more uniform at its maximum f/1.4 aperture compared to the Zeiss and Sony competitors at f/1.8. All three are at their sharpest around f/4, but again, the Sigma version offers increased resolution in the center, and is noticeably more uniform, too. Despite a lower overall vignetting score for the Sigma 30mm f/1.4, it’s worth noting that this was recorded at its maximum f/1.4 aperture. Close down 1 stop to f/1.8, and corner shading on the Sigma is more comparable to Zeiss at the same setting and an improvement over the Sony E 35mm f/1.8. The Sigma clearly distorts more than the Zeiss and Sony competition, which is something to watch out for, but as previously noted, this can be easily corrected in post-production. The Sigma 30mm f/1.4 DN is an excellent standard prime option for Sony E-mount cameras and ranks at the top for all lenses we’ve tested on the A6000. Sharpness is outstanding, delivering excellent center resolution at all aperture settings up to f/8, with only minimal drop-off in the corners. Vignetting is pretty heavy at f/1.4, as the lens struggles to achieve the same intensity of light across the large APS-C sensor at its maximum aperture, but it improves greatly by f/1.8 and is all but eradicated by f/2.8. Compared to the significantly more expensive Zeiss 32mm f/1.8 and Sony’s own E 35mm f/1.8, the Sigma version is both sharper in the center and more consistent across the frame. Add to that the faster maximum f/1.4 aperture, and the $339 Sigma 30mm f/1.4 DN looks to be a very attractive standard prime option for Sony mirrorless photographers.